The Emergency Manager 1 course is an academic program consisting of 80-hours of classroom education, with one 3-hour session each week and four 8-hour weekend sessions delivered over the course of four months. Students complete a total of 134 hours of coursework between classroom lectures, homework assignments, and quizzes/exams. The course provides entry-level academic and practical training for individuals aspiring to enter the emergency management profession or those who seek to refine their current knowledge and skills. New Jersey Certified Emergency Manager: The New Jersey Emergency Management Association (NJEMA) administers the New Jersey Certified Emergency Manager (NJCEM) credential and the Emergency Manager 1 course satisfies the minimum training requirement, if you plan on pursuing your certification. Please visit NJEMA.org for more information about the NJCEM credential, including how to apply. *Note: Completion of the Emergency Manager 1 course does not guarantee that you will receive the NJCEM credential by NJEMA. IAEM Certified Emergency Manager®: IAEM has recognized the Emergency Manager 1 course as satisfying 134 (of 200) hours of the training requirement towards the IAEM Certified Emergency Manager (CEM) credential. EM1 graduates may receive 100 hours of emergency management training AND 34 hours of general training towards the training requirements when they submit their IAEM CEM application. 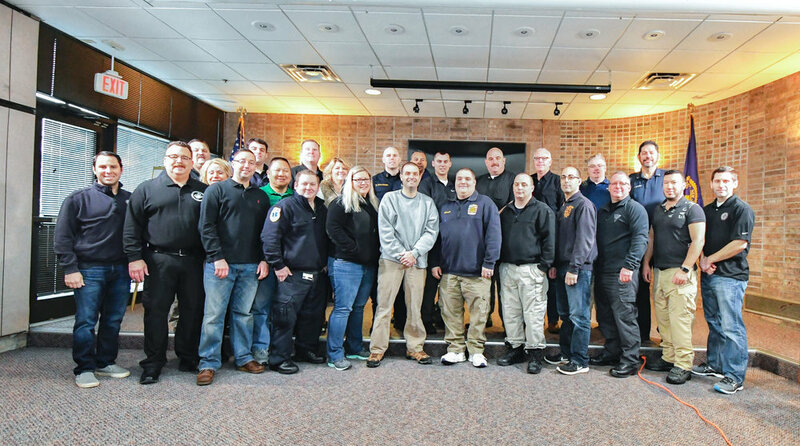 EMS CEU's: The New Jersey Department of Health - Office of Emergency Medical Services has awarded EM1 24 elective CEU's. HSEEP: The Homeland Security Exercise and Evaluation Program (HSEEP) is integrated into EM1. Students complete the HSEEP program on the second and third Saturday's of EM1 and receive an official HSEEP certificate from FEMA upon successfully completing the program. Academic Credit (Matriculating Students Only): The Emergency Manager 1 course can be used for undergraduate and/or graduate credit at the Petrocelli College of Fairleigh Dickinson University. Undergraduate students can use this for three credits in Personnel Management for Emergency Services (PADM 4516). Graduates can use it for three credits as a substitute for Theory and Practice of Administration (MADS 6600) on completion of an additional assessment assigned by the faculty. Recognition: This course is recognized by the New Jersey Emergency Management Association, the New Jersey County Coordinator's Association, the International Association of Emergency Managers, and Fairleigh Dickinson University. Emergency Manager 1 Graduate Networking: Graduates of the Emergency Manager 1 course have either worked for or been hired by agencies that include: FEMA, NJ Office of Emergency Management, NJ Department of Environmental Protection OEM, NJ Department of Transportation OEM, FDNY, Health Network Emergency Management Agencies, County OEMs, and Municipal OEMs. The Emergency Manager 1 course is specifically designed for individuals wishing to enter the emergency management profession or individuals currently working in emergency management roles without any formal education or training. We welcome experienced emergency managers who wish to enhance their current knowledge but would encourage you to review the course agenda to ensure you understand the depth and scope of topics covered. You do not need to be an emergency management coordinator to attend. The following minimum requirements must be completed prior to the start of the class. The most recent versions of each course must be completed. This ensures that all students have a baseline understanding of emergency management and the most updated information. The course registration fee is $500.00. Full payment is due by the start of HSEEP. 1. I have a scheduling conflict and must miss a class. Is that okay? Yes. We allow for two absences for the week night lectures BUT you must attend that lecture at one of our other course locations within one year to graduate. We do not allow for any weekend class absences. 2. I already have HSEEP. Do I have to attend Saturday 2 and 3? Yes. Starting in 2017, all EM1 students are expected to attend all classes, including HSEEP, regardless if you already have an HSEEP certificate. 3. Will I receive an official FEMA HSEEP certificate? Yes. The HSEEP course is the official FEMA HSEEP course embedded within Emergency Manager 1. All EM1 students who pass HSEEP will receive an HSEEP certificate from FEMA several weeks thereafter via email. HSEEP certificates are processed and issued by FEMA, not Emergency Manager 1. 4. If I pass Emergency Manager 1, do I become a New Jersey Certified Emergency Manager (NJCEM)? No, not exactly. Crossroads Education, LLC administers the Emergency Manager 1 (EM1) course. The New Jersey Emergency Management Association owns and administers the NJCEM credential. Passing EM1 will meet the training requirement for your NJCEM application. There are other requirements you must meet to obtain your NJCEM credential which are outlined on the NJEMA website at NJEMA.org. 5. Can I receive college credits for passing Emergency Manager 1? Maybe. Fairleigh Dickinson University will award academic credits for matriculating students only. Undergraduate students may use EM1 for three credits as a substitute for Personnel Management for Emergency Services (PADM 4516). Graduates may use it for three credits as a substitute for Theory and Practice of Administration (MADS 6600) on completion of an additional assessment assigned by the faculty. 6. Can I pay with a purchase order? Yes. When you submit your registration form and payment information, you will receive an electronic invoice shortly thereafter. If you do not receive that invoice, please check your trash or spam folders. With your invoice, you will also receive our W9 form and business certificate. These documents are usually required when you submit an invoice to your agency for processing. 7. I only have a high school education. Will I be overwhelmed in this course? No. Many students find the course to be both challenging and rewarding. EM1 is undoubtedly a significant time commitment. When you factor in classroom lectures, weekend classes, homework assignments, quizzes, and supplemental readings, EM1 is approximately 134 hours of total coursework. If you commit to succeeding, you will succeed, regardless of your formal education level. 8. I have many years of emergency management experience. Can I challenge the exam? No. Our students range from brand new, aspiring emergency managers to professionals with 40+ years of experience. EM1 is designed for all experience and education levels; we are confident that you'll learn something new and enjoy the course. 9. Can I get a refund if I withdraw? Maybe. We have a very simple refund policy. If you withdraw before the course begins, we will issue you a full refund. If you withdraw once the course begins, we will not issue you a refund. However, you can apply your payment to your registration for the following semester. 10. Do you have any seats left? Maybe. If there's a registration form below and the class you want to attend is listed -- then yes, we have seats available. We close the registration form when we no longer have any seats remaining. So, if you can register, then you're good to go! Please read ALL of the information above before registering, including the class dates. The registration process will take approximately 10 minutes to complete. Please be prepared with information about your education, employer or sponsoring agency, and prerequisite FEMA Independent Study coursework. You will NOT be asked to submit any prerequisite certificates now. Once you register, you will immediately be emailed a welcome letter with additional information and an invoice. You have the choice to pay the invoice immediately online or submit to your agency with a purchase order. Please note that you may not be able to register using a mobile browser. If you're on a mobile device (phone or tablet), you must request the desktop version of this website in order to successfully complete the registration form. Otherwise, use a desktop or laptop to avoid this issue.